NASA’s Mars Exploration Rover Opportunity has successfully climbed out of the Victoria Crater. “The rover is back on flat ground,” said an engineer who drives it, Paolo Bellutta of JPL. Opportunity used the same path to exit the crater and was used to enter the crater almost a year ago. “We’re headed to the next adventure out on the plains of Meridiani,” said JPL’s John Callas, project manager for Opportunity and its twin rover, Spirit. See more images from Opportunity’s climb…. Opportunity used its own entry tracks from nearly a year ago as the path for a drive of 6.8 meters (22 feet) bringing the rover out over the top of the inner slope and through a sand ripple at the lip of Victoria Crater. The exit drive, conducted late Thursday, completed a series of drives covering 50 meters (164 feet) since the rover team decided about a month ago that it had completed its scientific investigations inside the crater. Here, Opportunity is back where she was almost a year ago before heading into the crater. Look closely and try to figure out which tracks are new and which are from a year ago! 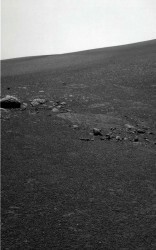 Opportunity stretches her robotic arm after leaving Victoria crater. See the crater in the background with the “Cape Verde” area (prominent ledge) visible. The crater spans about 800 meters (half a mile) in diameter and reveals rock layers that hold clues to environmental conditions of the area through an extended period when the rocks were formed and altered. The sun is behind this shot, creating shadows from the rover. Now that Opportunity has finished exploring Victoria Crater and returned to the surrounding plain, the rover team plans to use tools on the robotic arm in coming months to examine an assortment of cobbles — rocks about fist-size and larger — that may have been thrown from impacts that dug craters too distant for Opportunity to reach. Would it be impossible for one of the rovers to meet up with pheonix. I know there far from each other but could the rovers make it in there current condition. I’d like to see the rovers meet up with Phoenix, but that’s not going to happen. They want to keep these machines at a latitude where they can get enough solar power to survive. how come the tracks look so “fresh” ? I mean, it appears that the sand is wet somehow, or the rover must be really heavy to leave such deep imprints. As far as I know it is not really sand but very fine dust. The rover has a mass of about 175 kg or so (note that Mars has a much lower gravity than Earth). ok, but with all the sandstorms on Mars (and as I recall, there was even a global sandstorm just last year, but I may be mistaken), how come tracks from a year ago are still visible? What i have wondered often is why we keep talking about all this dust as though it were planetary and act like it is erosional debris. If the planet isnt all that active, wouldnt most of the soil be mostly a collection of space dust……debris from meteors and other junk that has collected for many millions of years? What? Is that all the distance they could penetrate into the crater. Either 5.8 meters or 50 meters is not very far compared to the depth and the breadth of the crater. It sounds like somewhat of a failed mission to me. I know it is VERY important to get the thing back out but they should simply say that they felt it was not safe to go INTO the crater like they had planned at the begining. Also some of you need to realize that Phoenix is nearly a quarter of the circumference of mars away from these rovers that cover only a few meters a day at the most. Hmmmmm, it is good sign that Mars Rover restrated their mission and already commenced journey again on the future living avod for mankind of the earth. They went just about as far into the crater as the rover could. Nearly all of the crater floor is covered in a layer of fine dust that the rover cannot traverse. In fact, Opportunity became stuck in the dust for several days while in Victoria crater, even while remaining in the upper reaches of the crater. During Opportunity’s earlier visit to Endurance crater, the rover also kept to the upper portions of the crater wall, and did not descend to the dust-filled bottom of the crater. This is not a failed mission as you suggest. The rover operators did in fact “simply say that they felt it was not safe to go [further] into the crater”. Despite your comment, there was never any plan to descend to the bottom of Victoria. The Rover spent nearly a year in the crater, it didnt need to go all the way in and around the inside the crater to get great scientific information. It just needed to get a cross section of the layers of rock exposed by the crater. Chances are that cross section is pretty similar all around the crater. There is no way either rover could ever get to the Phoenix lander. They are thousands of kilometers apart. The rovers have only travelled around 15km. Also, the phoenix lander won’t have a very long mission. As the Martian winter approaches, carbon dioxide frost will build up on the lander and surrounding ground. It is expected that it will become fully encased in dry ice a couple metres thick. It probably won’t wake up in the spring. Remember that the most amazing thing about this mission is that it was planned to last 90 days. It has lasted almost 19 times longer than that! Parts are damaged and wearing out. They have to balance the risk of studying things that are hard to reach versus breaking the rovers. Dust may kill the rovers, either from abrasion of joints and wires, or simply from building up on the solar panels so that the batteries can’t charge. As for the tracks in the dust … They look pretty fresh because the atmosphere is so thin. Only 1% as thick as out atmosphere. Even with very strong winds and weaker gravity it is hard for the thin atmosphere to move much dust and sand around. The sandstorms are huge, but dont carry anywhere near as much material as a sandstorm on earth can.